Santa Cruz is many things: beach town, surfer town, hippie town … the list goes on and on. One thing that often gets lost on the leftmost coast is that we are absolutely a dog-loving town. For many locals, taking their dog with them has became part and parcel of leaving the house and luckily, there’s enough places that allow it that you’ll have plenty of options. In this blog post, we take a look at some of the best local spots you can grab a bite with your pooch by your side. Seabright Brewery – The Seabright Brewery is also on our list of best local breweries and it’s a great place to take your pooch. With a spacious outdoor seating area that’s nearly as big as the interior, there is plenty of room for owners and pets alike to enjoy a relaxing outdoor meal (breakfast, lunch, or dinner) alongside the steady trickle of the outdoor fountain. The Seabright Brewery is located at 519 Seabright Ave. near Murray St.
Harbor Cafe – Just on the other side of the harbor from the Seabright Brewery is the Harbor Cafe–another great spot to enjoy a meal with your dog. The Harbor Cafe also has plenty of outdoor seating, but it is primarily a breakfast and lunch spot since it closes at 2 p.m. The Harbor Cafe also made the cut of our best local breakfast spots in Santa Cruz, particularly for those to try their delicious mimosas. Hoffman’s Bistro (Downtown) – Hoffman’s is a downtown favorite of many locals, particularly after the renovations and changes brought on by their stint on the TV show “Restaurant Impossible.” There is a small outdoor seating area that allows dogs. 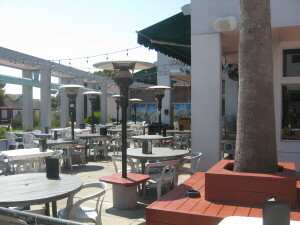 Surfrider Cafe – The Surfrider Cafe has a couple of outdoor tables around the perimeter of the restaurant that allow dogs while eating. 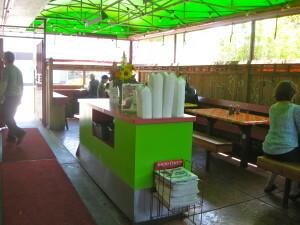 As for their food, they have a nice selection of sandwiches, including plenty of options for vegetarians. They also have a decent beer selection and multiple TVs, on which you can usually find local sporting events. They do not currently have a website, but you can stay up to date on what’s going on by visiting their website here. Charlie Hong Kong – A local favorite for lovers of Asian street food, Charlie Hong Kong has more outdoor seating than it does in its small main building. Unlike some of the other places on this list, their outdoor area is fully covered, providing a nice amount of shade. It is often a rather crowded place to eat so you should keep that in mind if you’re going at peak hours. They generally have a dish set out with water for dogs.